Hey, y’all! I’m J, and I blog over at An Unstyled Life. I am so excited to be guest posting on From PDX with Love! I love, love, love this blog, so when I begged and Sophia said I could guest post, I freaked out just a bit. And then I started to hyperventilate because I had no idea what I was going to talk about! Should I cover something parenthood related? After all, I do have a two year old. This is M. She’s a tiny little thing, with a personality 10 times as big as she is. But, I decided against it. Mostly because I always feel like I should be taking parenting advice and definitely not giving it. And then I thought, ok, maybe a DIY post. But the problem with that is that I have a bad habit of starting a DIY project, and never finishing it. My house is like the place where crafts come to die. So, one thing I knew I could write about was food. I lovelovelovelove looooove food. But, ever since M came along, I’m all about easy food. Which is why my crock pot is my best friend. In fact, I am currently doing a bit of a challenge where I cook every dinner in our crock pot. The Two Week Crock Pot Challenge, as I like to call it. I like to name things, BTW. My car is Bessie, my laptop is Isabelle, and my iPhone is Lola. Alright, I originally found this recipe here, but edited it a bit after reading the reviews. Let me first say that if you aren’t using Reynolds crock pot liners, you’re missing out. These are the greatest thing since, well, the crock pot! OK, back to the chicken and dumplings. It doesn’t look very appetizing, but I swear, it’s delicious. Again, sorry for the horrible phone photo! So, that’s it. That’s my crock pot chicken and dumplings. Let me know if you give it a try, and stop by the blog if you’d like more crock pot recipes! Thanks for having me! Hey, y’all! 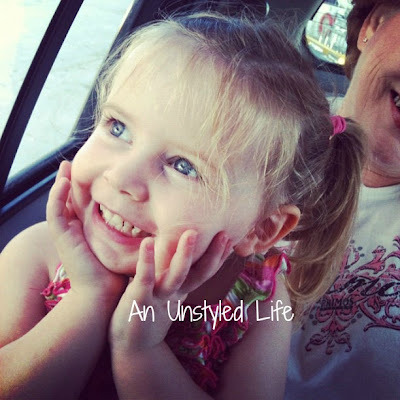 I’m J and I blog over at An Unstyled Life. I’m a part-time bail bondsman, a full-time event planner, a full-time social media manager and a full-time wife and momma. *deep breath* I mostly blog about our life, but I’ve been known to blog about trashy reality shows (I’m addicted! ), maybe a little fashion, and pretty much anything that strikes my fancy. I love finding new blogs, so come say hi so I can visit yours! You can also find me on the twit, facebook, and pinterest! Not all of us have time for perfect presentation (well, not me), and I’ve learned that it doesn’t have to look good to taste AMAZING. I will definitely be trying this recipe soon– it’s right up my fiance’s alley! It’s definitely the taste that’s most important! Plus, I’ve learned with crock pot food, you normally don’t get “pretty”! Thanks for the challenge to crock pot cook and the recipes. Planning on heading to your site to get the roast beef sliders recipe. Well, just went there and can’t find the recipe….I don’t see a search box or a category listing….can you share it here? I plan on posting a first week wrap up tomorrow, it’ll be there first thing in the morning! I love Chicken and dumplings! I am definitely going to try this recipe! I’m definitely going to try this recipe and it just so happens that I have all of the ingredients on hand so I think I’m going to give it a shot tomorrow! I’ve been looking for a great chicken and dumplings crock pot recipe! We’ve gotta try this! Thanks! This is a slight variation on a recipe I currently make but mine just rests the biscuits on top. I like the idea of having them in there, soaking up the liquid. Thank you!! The dumplings were so flavorful! Sounds delicious – I’m always looking for new slow cooker recipes! I will definitely be trying yours out! My Family loves Crackerbarrel’s Chicken and Dumplings and I’m sure they’d love this as well! Such a comforting Fall dish. I *love* Cracker Barrel chicken and dumplings! And my bail bonds life isn’t very exciting, we’re just a small company in a teeny tiny town, so we don’t see much excitement. Although I have been out with a bounty hunter before, that was definitely interesting! I’ve never used a crock pot liner, but I’ll definitely try to find them this fall! I love this kind of comfort food, especially when it’s chilly. Thanks for the recipe! It doesn’t get “chilly” in our part of Texas until late December, but we’ve had a bit of a cold front come in, so at least it’s not 100 degrees! I’m waiting for cooler weather so I can make chili! Looks good! I’ll have to make note of this to try sometime soon. Thanks for sharing! I have officially added this to my menu. My boys are going to be thrilled. My kiddo ate two helpings of it! What is it about chicken and dumplings that kids love so much!? okay, so I know this is highlighting the recipe, which looks yum, but omg I had no idea about liners! I cook EVERYTHING but men and money in my crockpot and I am so buying these! LOL, “but men and money”!! I didn’t know they existed until a few weeks ago, but OMG I’ve fallen in love with them! My mom introduced me to the cooking liners a couple of years ago and I love them. I will never use my crock pot again without one. Thanks for the recipe. How have they been around this long and I haven’t known about them before now!? I’ve never had chicken and dumplings… :S I guess I’ll have to give it a try soon!! This recipe sounds delicious! Thanks! That looks so delish and easy! I love using my crock pot! Thanks for the recipe.. gonna try it with turkey now that thanksgiving is done. I didn’t know about the crock pot liners… A MUST GET now! Cant wait to try this recipe. One of my favs. So simple and straightforward and tons of taste! Definitely going to make this! Sounds delicious!